Create a folder in your email system called "Waiting Room". Create a reverse spam filter which only allows email addresses in your Inbox from people you know. The same email filter should move all other email into the "Waiting room" folder. This will streamline being able to work smarter with responding to important emails. Later in the day, you can sift through the Waiting Room folder. If you spot an email from someone you know, place them in the reverse spam filter. June 4-6, 2006 is the Home Entertainment Show at the Sheraton Gateway Hotel in Los Angeles, CA. Products manufactured for the audio/video home entertainment market, make it easier for people to reproduce movie theatre quality experiences. Many products require specialized knowledge to setup and operate. Something as simple as tuning the right TV picture coloration, may not be that straight forward. In walks many opportunities for home entertainment professionals. There are various aspects to installing the home entertainment, which may not be obvious. Setting up a system requires consideration for room layout design, correct cabling as well as engineering skills. A project manager may need to be hired for elaborate home entertainment systems, which can cost upwards to over $200,000. Long term analytical and problem solving skills also come into play. This insures a continuous source of referrals. The key is to design home entertainment systems which are scalable. How can the current system be expanded or modified when new technology comes out, with a minimal amount of expense? This is a profitable niche market for "inspector gadget" types, who have a solid skill level in operating various audio/visual equipment. Training owners of home entertainment equipment means extra money, after the design and setup. Make sure you enjoy working with people, before making the plunge into this market. Your clients may not get it as easily or quickly as you. So, patience is a big plus to making this business profitable. I would recommend bolstering your skills with some formal training. A starting point can be CNET's Home Entertainment Clinics. As with any industry, people who specialize always make more money, than those who generalize. Identify which products are in big demand, but few people have the required knowledge to setup and operate them. Think fast. What famous stadium is pictured in this satellite photo? I took this picture from my desk in Manhattan using Google's latest toy called "Google Earth". After downloading the free software, you type in a street address any where in the world. Voila, Google Earth allows you to look through the lenses of a satellite camera, taking you right to the top of the building. Imagine a satellite miles above earth providing a clear crisp photo of a building, like you're right next to it. We are surrounded by opportunities with sound bytes of what's to come in the satellite business. It's in its infancy. Now is the time to prepare. 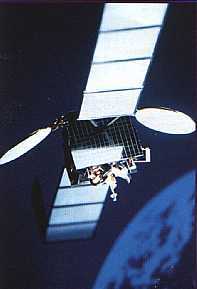 The 4th Annual World Satellite Business Week conference is scheduled for September 4-7, 2006 in Paris. A recent Business Week article by Olga Kharif says " Everyone's Aiming at Satellite Radio. Rival technologies and services are popping up all over. Apple may even get into the game. The competition for ears will be deafening." The Olga's article goes on to state the 2 major players signed up 9.3 million paying users by the end of 2005, compared with fewer than 4.5 million a year earlier. Occupational Outlook Handbook from U.S. Department of Labor indicates "The major threats to the radio industry, especially smaller, marginal stations, are from car CD (compact disk) players and from satellite radio, which functions like cable television with subscribers paying a monthly fee." There is even a "Society of Satellite Professionals International". It's a nonprofit member-benefit society that serves satellite professionals throughout their careers. A quick glance at their membership application gives clues as to current and potential opportunities in the satellite industry. Take your pick of what career track suits you in the Satellite business. Some are obvious; teacher, engineer, manager and research & development. Some additional opportunities in satellite are finance, sales, consultant, operations, procurement, customer service and marketing. Let's we not forget our terrestrial radio station engineers considering that career transition to satellite. There will be even more opportunity for dealers and installers of satellite entertainment equipment. Heck, even people with blogs or web sites can cash in by becoming affiliates. Decent commissions are paid for new satellite radio subscribers bloggers recommend from their site. 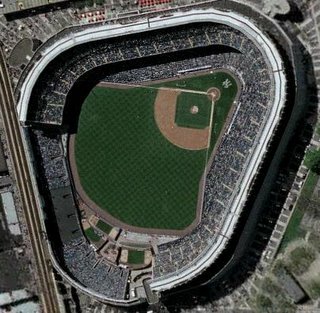 Did you come up with Yankee Stadium in the satellite photo above? Is It Time to Change Skill Gears? With almost 25 years of IT experience I have never wasted time tinkering or learning a new technology, unless I saw a profit potential. Oh I'm inspector gadget just like any other red blooded guy. I'm addicted to my Blackberry. Playing with my Blackberry and learning all aspects of it, including implementing the Blackberry Enterprise Server for Lotus Notes, has paid huge profits in consulting assignments. I've seen many IT professionals get their feelings hurt and become disappointed , when they tried to sell technology skills that were not in demand. It's marketing 101. Meet a customer at their need. Don't forget your geography lessons when considering a skill transition. Do your homework to make sure your new skills are in demand. One of the best indicators is being able to decipher "want ads" in a local area. If you trend want ads, this built in radar system will help you decide what direction to learn new technology skills. Want ads should be used as indicators for where to adjust your skills. They are not necessarily good vehicles to apply for jobs. Using your network of contacts is your best bet for landing opportunities. Click here, if you don't have a personal network. Keep in mind companies are getting more savvy in their technology staffing requirements. They want more specialty skills. Just like doctors and lawyers, specializing within a technology area still dictates earning potential and minimizing competition. Identify technology skills where the demand is high, but not many people have that skill set (i.e. Linux administrators). This sky rockets income. When you see the market starting to saturate (i.e. MCSEs), change skill gears again. .Net and Java will continue to be the preferred golden children of skill sets in demand. With an increase in identity theft, viruses and the potential threat of terrorists crippling society with computer network infiltration, skilled security specialists can write their own ticket. There is a back log in projects due to economic factors over the last couple of three years. Companies are demanding PMs have their PMI certification. Specific areas of specialties are Health Insurance portability, Sarbanes-Oxley and accounting compliance. Disaster recovery planning is another hot area. As the back logged projects swing into high gear along with application/system rollouts from 2005, helpdesk staff are still required to perform more support. There are specialties in the helpdesk arena.